Just days after we told you about Sharp’s decision to stop supplying LCD panels to global TV leader Samsung – a decision that shocked many in Japan – apparently, they’ve done it again. The Nikkei in Japan is reporting that panel pricing negotiations have apparently broken down between Sharp and China’s Hisense Group with the parties unable to agree on a fair price. As a result, Sharp has notified Hisense it will also stop supplying them with panels in 2017. Just last week, we learned about the surprising news, reported on by almost all of the media in Japan, that Sharp had notified Samsung it would no longer supply it with LCD panels starting in 2017. In that situation, much like this one, word was that price negotiations had broken down between the parties working on a new supply agreement. In effect, Sharp had terminated Samsung…their largest LCD panel customer. Now reports are that Sharp is taking the same position with China’s Hisense, another large TV manufacturer. Certainly, like other media, we have been reporting on Sharp’s many problems, including their struggle with generating substantial annual financial losses. In fact, it was their deteriorating financial condition that drove them into the arms of Terry Gou, chairman of Hon Hai Precision Industry Co., the large Taiwanese OEM manufacturer that is better known as Apple, Inc. supplier Foxconn Technology Group. Foxconn has vowed to right the Sharp ship and to drive the company back to profitability again. As such, with Foxconn now calling the shots, Sharp executives are said to be adopting tough tactics in negotiating for more profitable panel pricing with TV manufacturers. But customers like Samsung and Hisense are pushing back. 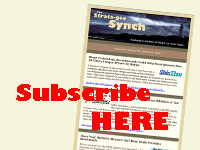 Some in the industry told us that they thought that Sharp’s strategy was crazy. Samsung, they suggested, would simply go to another supplier to get the panels they need…and Sharp would be the ultimate loser. But the calculation of who wins and who loses is not quite that easy. 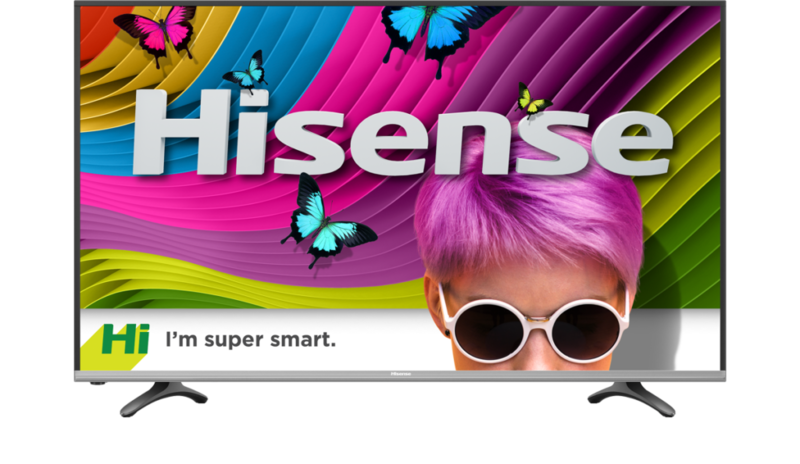 Samsung Scrambling, Now Hisense Too? Market reports showed clearly that Samsung was absolutely scrambling to find alternative suppliers of quality LCD panels at this late date. Sharp, one report indicated, had supplied Samsung with 5 million panels in 2015 (the last full year for which data was available). This number was likely even higher in 2016. So can’t Samsung simply increase their orders with their other panel suppliers? Most OEM manufacturers need to hit a certain capacity level in order to efficiently – and hopefully profitably – manufacture their panels. Too little capacity and they won’t get the supply contract. Too much capacity and then they have factories, lines, and machines sitting idle – a very expensive proposition that takes a bite directly out of their bottom line. The reality is that parts manufacturers typically do not have a tremendous amount of excess capacity sitting around – waiting for a potential last-minute opportunity. 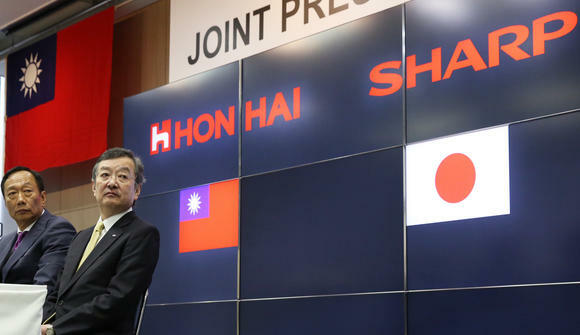 Image from a joint Hon Hai and Sharp press conference. Over time, of course, these manufacturers can build more capacity. But it takes a substantial amount of time to build factories, or add production lines. In the short run, there is only so much that can be done. Hence, as we reported last week, Samsung was scrambling to find enough supply to meet their projected unit needs. How hard was this going to be? Apparently, so hard that Samsung was forced to go, hat in hand, to archrival LG to ask them to supply LCD panels. These companies are not friends. In fact, they are brutal competitors, locked in a battle to dominate the business both in their local South Korean market…and around the world. All LG would say publicly about the Samsung’s request is that “it will consider Samsung’s highly unusual request with a positive attitude – but ‘it’s difficult to predict if their negotiations will lead to an agreement,’” Translation, don’t hold your breath Samsung. Is Foxconn Planning on Relaunching Sharp Manufactured TVs? The Nikkei is reporting that there may be another strategy behind Sharp’s new, tougher negotiating stance. Foxconn is said to be planning on a resurgence of sales of Sharp’s Aquos premium line of LCD TVs. In fact, Foxconn is projecting that they will double sales to 10 million units in fiscal 2018, their next fiscal year. One way they will do that is by exanding their global market presence. But this plan has some challenges. As Sharp sought to cut the losses of their TV division, they decided to pull out of the North American market and license their brand to a third-party TV manufacturer. Now they want the market back. Who was that manufacturer that now holds the license for the Sharp brand for North America? Why, none other than Hisense, of course. A Squeeze Play on Hisense? If Foxconn is planning a major Sharp comeback, then terminating panel supply agreements with other manufacturers could be an effort to build panel supply for a new wave of Sharp branded and manufactured TVs…including those targeted for North America. But it also could be a squeeze play on Hisense…cutting their supply so that they are unable to take advantage of holding the license for the North American market. If they have no TVs to sell in North America, Hisense would be more likely to sell the license back to Sharp.